WASHINGTON — President Donald Trump and his allies are claiming that the partial contents of a secret national security "FISA" warrant, released Saturday, vindicate their claim that special counsel Robert Mueller's Russia investigation was improperly launched on the basis of a speculative opposition research document paid for by Democrats. The Trump camp says the probe has its roots in the "Trump dossier" compiled by former British spy Christopher Steele, which alleges collusion between the Trump campaign and Russia. Trump also continues to suggest that the electronic surveillance of his one-time campaign aide, Carter Page, which was authorized by the FISA warrant, launched the Russia probe. The Russia investigation wasn't launched because of Carter Page. The heavily redacted documents released Saturday comprise an application to, and subsequent renewals by, judges on the Foreign Intelligence Surveillance Court allowing the FBI to investigate Page, a foreign policy aide to the Trump campaign. But it's already been established by the House Intelligence Committee that the Russia investigation began after the FBI learned that another campaign aide, George Papadopoulos, had been approached by a Russian agent. The agent told Papadopoulos the Russians had incriminating information about Hillary Clinton, including emails, according to court documents.. Papadopoulos then mentioned to an Australian diplomat that the Russians had "dirt" on Clinton, the Australians contacted the U.S. government, and the FBI began to take a look. The so-called dossier formed only a smart part of the evidence used to meet the legal burden of establishing "probable cause" that Page was an agent of Russia. The released documents contain dozens of pages that are entirely blacked out. People who have read them, including Rep. Adam Schiff, the ranking Democrat on the House Intelligence Committee, say they contain secret evidence establishing ties between Page and Russians — evidence that goes beyond what was included in the dossier compiled by Christopher Steele. Frank Figliuzzi, the former FBI counterintelligence chief who is now an NBC News contributor, says that likely includes reporting from human sources and intercepted communications. Page, it should be said, denies that he was an agent of Russia and has not been charged with a crime. National security experts who have reviewed the document say that even the parts that aren't blacked out contain more than enough information to provide a judge reason to rule that the FBI had probable cause to believe that Page was an agent of Russia. Probable cause is much lower than the reasonable doubt the standard required to convict someone of a crime. "It's the probability of a possibility," said William Banks, director of the Institute for National Security and Counterterrorism at Syracuse University College of Law. Page had already appeared on the FBI's radar as a target of Russian intelligence recruitment in a separate spy case. He has acknowledged that he traveled to Moscow and met with Russian officials during the 2016 campaign. It would have been malpractice for the FBI, confronted with allegations that Page was helping the Russians, not to investigate, Figliuzzi says. 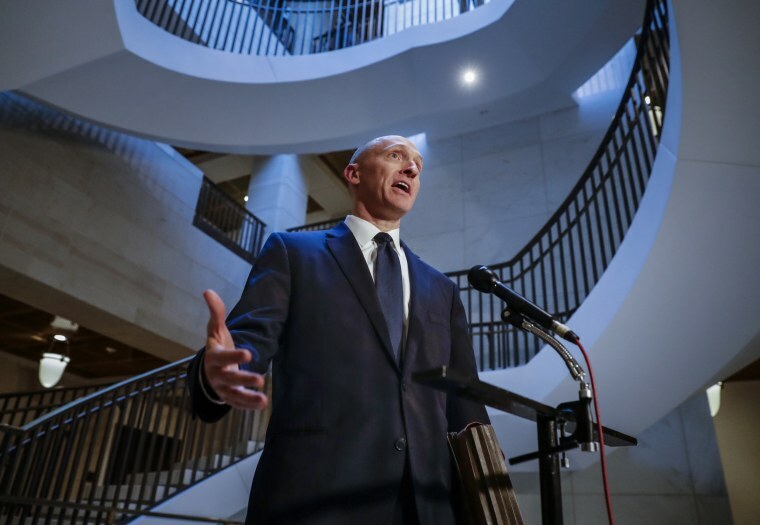 Four different judges, all appointed by Republican presidents, signed off on electronic surveillance of Carter Page. And that's the end of a long process that involves multiple layers of review within the FBI and the Justice Department, current and former officials say. Anyone trying to put one over on the FISA court would be risking his or her career. It was not improper — and perfectly normal — for the FBI to disclose information from the Steele dossier as part of the warrant application. Andrew McCarthy, a former prosecutor and Trump backer, has argued that the dossier amounted to unverified hearsay, and that the FBI misrepresented that it had verified the information. But Figliuzzi and other former officials say the use of hearsay is common in warrant applications, because the FBI wants to tell the judge as much as possible about what is known about the target. No judge, however, would grant a surveillance warrant based entirely on hearsay, Figliuzzi said. The FBI disclosed to the court that Steele was paid by people seeking to discredit Trump. But the FBI viewed Steele as credible. "They dealt with the Steele stuff in an extensive footnote with bolded language," Banks said. The note didn't disclose that the dossier was paid for by Democrats because the document didn't use any names or identities. It called Trump "Candidate 1" even after he was elected president. But the note did say that the dossier appeared to be funded by people seeking to discredit Trump. In addition, Steele was seen not as a partisan operative, but as a credible source, according to the warrant. The document doesn't say this, but Steele had helped the FBI for years, including providing crucial information in the U.S. investigation of corruption in international soccer.